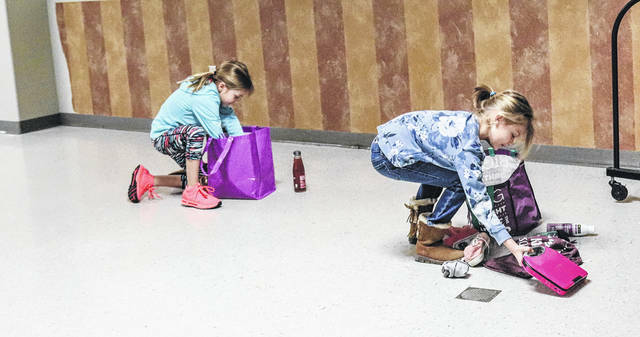 Harper VanTilburgh, 8, of Sidney, daughter of Jenn and Chris VanTilburgh, and Jordan Evans, 8, daughter of Ryan Evans, of Sidney, gather items that they can use for hiking in a game at Girl Scout day camp Monday at the Sidney First United Methodist Church. The three-day camp is for girls who are not enrolled in Girl Scouts. Camp activities include games, hikes, singing songs and making crafts.